The AgustaWestland AW609 is a twin engined tiltrotor aircraft designed for the civil aviation market. It is currently still a prototype being tested for release. 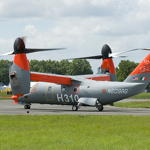 In the summer of 2013 Schaeffer Precision Alignment was hired to provide metrology services for the AW609 in Arlington, Texas. Using the laser tracker tracker to gather data about the aircraft our laser tracker team was able to provide critical measurement coordinates needed to help further modify the AW609. In order to refine the AW609 prototype Schaeffer Precision Alignment used the API T3 laser tracker to provide exhaust port data for dimensional analysis. Additionally our laser tracker team provided symmetry checks on both the left and right side of the aircraft. Thousands of data points were gathered by our team of metrologists onsite and completed in one day. Watch the video below to see the AW609 in action. Schaeffer Precision Alignment offers aircraft metrology services across the USA for commercial, military, government, and private aircraft.